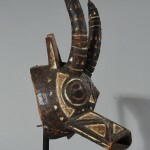 This colourful mask with a fascinating symbolic meaning is created by the Bobo Nunuma or Winiama peoples who live in eastern Burkina Faso and Mali in a region of dry savannas where harvest depends on rainfall. 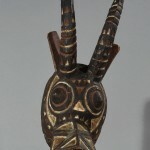 The Bobo are farmers and their art is primary used in purification rituals meant to reconcile man with nature. 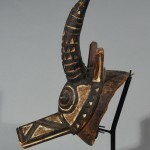 For the Bobo masks have the essential function of erasing evil and reinstating the God-given balance between sun, earth, and rain. 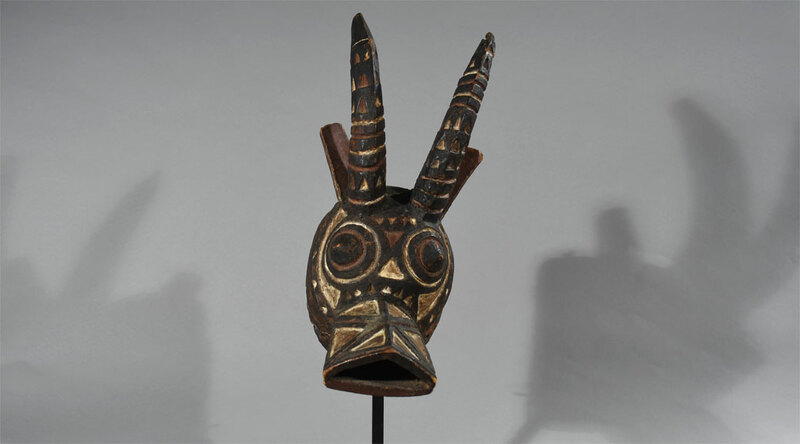 At the end of the dry season and before the work of cultivation begins, purification ceremonies take place, using masks in the shape of animals. Animals like the buffalo, antelope, serpent, and hawk incarnate forces of fertility, fecundity, and growth. 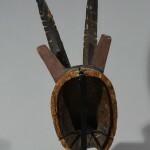 Among the Bobo, the sacredness of the mask derives from the fact that the divinity is considered to be present in the mask and, through it to be acting. 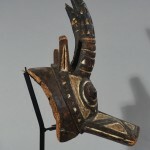 The wearer is depersonalized to the advantage of the mask that he animates. To be a “mask”, man had to erase himself, that is to say, cease to be himself, shed his individuality.